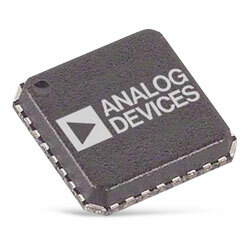 The Tunable Band-Pass Filters from Analog Devices are Monolithic Microwave Integrated Circuits (MMICs) featuring a user selectable pass-band frequency. The centre frequency is variable between 3.45GHz and 6.25GHz by employing an analog tuning voltage between 0V and 14V. The HMC892 MMIC’s band-pass filters can be used as a greatly smaller choice to physically large switched filter banks and cavity tuned filters. These monolithic designed filters provide a dynamically adjustable solution for advanced communication applications. Suitable applications comprise satellite communications, test and measurement equipment, defence RADAR and electronic defence, industrial solutions and medical equipment.